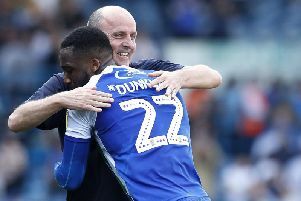 Paul Cook insists he doesn’t begrudge his players going away for international duty – even if it means Wigan Athletic are left to pick up the pieces. Cook could be without Will Grigg until the New Year after the striker damaged his hamstring playing for Northern Ireland last week, while Antonee Robinson and Sam Morsy have also been clocking up the air miles on duty for the USA and Egypt respectively. Cook, though, chooses not to jump to the default setting of most club bosses in bemoaning his lot. “I see international managers having spats with club managers, and I don’t get that,” he said. “As far as I’m concerned, lads have got to be allowed to go and play for their countries. “Come on...lads must encouraged, if not actually sent packing to go and play for their countries. “As a club manager, there’s always a temptation to look at it selfishly, and want to keep all your players away from possible injuries. “But the international managers have it tough as well. Not that Cook has enjoyed the last fortnight, stewing over Wigan’s 4-0 drubbing at Preston on October 6. “I can’t really grasp the international breaks if I’m being truthful,” he said. “I just think it’s so disruptive to what you’re trying to do. “The best thing about football, is being able to bounce back quickly from a defeat. “If you remember the recent defeat at Brentford, we were able to beat Hull on the Tuesday and then Bristol City on the Friday, and it’s all positive again. “When there’s a two-week gap after a defeat like Preston...to say it was painful wouldn’t be doing justice to pain. “It’s beyond painful. It’s like a long, slow torture. Cook could scarcely have picked tougher opposition against whom to return than a West Brom side bang in form. “We’re walking into a team this weekend that in my view is up there with the best in the division,” the Latics boss added. “Strength, experience, pace, energy...it’s all of the above. “While we’re trying to right a wrong at Preston, we’re having to do it against a side as good as you’ll see in the Championship. “But this is why we’re in the Championship, and why we fought so hard to get promoted last season.